Part One: How do kids get money? To kick off our series Teaching Kids about Money, we are tackling the most basic concepts, earning & using money, in January. Part Two: How much control should kids have over their money? One of the first questions that is generally asked about kids and money is “Should I give my child an allowance?” Unfortunately, there isn’t an easy answer to that question. There are strong opinions on both sides of this issue. Folks who are against allowance may view it as an entitlement or a hand out. They prefer their kids to complete jobs to get their own money. Supporters of allowance view it as a teaching tool. They provide books to help a child learn to read and bikes to help a child learn to ride a bike. Likewise, an allowance is simply a tool to teach their child how to manage their own money. Of those who support giving an allowance, there are many different opinions on how to structure the allowance system and whether or not to tie the allowance to chores or grades. Basic Allowance: Think of this as a traditional allowance. The parents give the child a set amount each week. Some people base the amount on the child’s age or grade in school. $1 per year of age or grade in school is very common. However, I always recommend that the first consideration when determining the amount of allowance is to decide upon an amount that fits within the family’s overall budget. If you can’t afford $10 per week, then don’t give it! Save Spend Share Format: This allowance system takes a traditional allowance payment and divides it into three categories --- Saving, Spending and Sharing. (Some people add a fourth category --- Investing). For example, if your child receives $10 per week in allowance, you may have them divide the payment into $4 for Saving, $4 for Spending and $2 for Sharing (charity donations). Conditional or Unconditional allowance: Many families tie the allowance payment to chores or grades. This is another area that creates very strong opinions. If a child doesn't complete a set list of chores or doesn’t maintain a specified grade in school, they do not get their allowance. Some families implement a combination of chores, assigning some chores as required and not paid while others are optional paid jobs. Clark Howard describes a nice system in Clark Smart Parents, Clark Smart Kids that combines allowances, required chores & paid jobs. Frequency of Payments: How often do you award allowance? I would recommend that younger children receive allowance once per week. As they get older, they can switch to a monthly allowance. A monthly allowance requires more budgeting skills to make it to the next allowance payment. This only works if the parents stick to the plan and do not give extra money if the teen spends it too quickly. When to end allowance: If you start an allowance system with your children, have a plan for when you will end it, or in business terms, have an exit strategy. Will it end when your teen gets a part time job? Will you continue to pay some version of allowance when they are in college? Consistency: Do your research before you start a system so that you are not switching gears after a few weeks. Kids learn from repetition and consistency. Money from gifts is another source of income for kids and teens. With our children, we have noticed that as they get older, the frequency of money and gift cards as presents increases. Our oldest son’s birthday is very close to Christmas so he tends to get a lot of money within a very short amount of time. The tendency for younger kids is to spend it immediately. It “burns a hole in their pocket”! As he has gotten older, he is learning to ration it out and make it last longer. Regarding gift cards, kids and teens need to view those as cash, not as a free shopping trip. A third source of income for kids and teens is doing paid jobs around the house. These generally fall outside the normal every day, household chores. Examples of jobs in our house that we pay for are: steam cleaning the carpet, washing the baseboards, filing papers, MoneyTrail testing, waxing the cars, washing windows and babysitting siblings. Each family can determine what chores are considered family obligations and what extra jobs are available that the parents would be willing to pay the kids to do. These will vary from family to family and will often depend on the age of the kids. A new twist on payments from parents is the Earn My Keep system. Alisa T. Weinstein developed this unique program in her book, Earn It, Learn It. Kids pick a career and complete tasks during the week to learn about the career. Parents provide a paycheck at the end of the cycle. The Earn It, Learn It book contains 50 careers and tasks relating to each one. Check out my review of the book..
A fourth source of income for kids & teens is to create their own business. In the past year, I have learned of many successful youth entrepreneurs who have created businesses that include jewelry making, app development, cookbook authors and computer repair services. Parents can encourage kids and teens to examine their own strengths and interests and investigate the possibility of turning those interests into money making jobs. The sky is the limit! An excellent resource for parents and children who are interested in entrepreneurial endeavors is www.raisingceokids.com. Finally, teens can start looking for jobs with businesses at the ripe old age of 14 (according to the Department of Labor’s website). It’s always a good idea to check your state’s regulations on this. Working outside of the home is a valuable experience for teens. They learn responsibility, interacting with the public and other various on-the-job skills. They have to balance their time between work and school. Even the process of interviewing and landing the job is highly educational. Here are tips for creating a great resume and for landing the first job. Kids and teens have a variety of sources of income that are available to them. Once they have a little bit of money, the next big step is being able to use it in a responsible way. 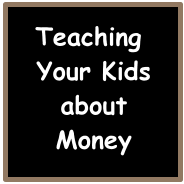 In Part Two of the January edition of Teaching Your Kids about Money, we will look at how much control kids and teens should have over their money. Be sure to subscribe via email or RSS so that you don’t miss Part Two. Nice article. Starting at grass roots level and teaching children the right money habits will stand them in good stead for when they are adults. Many adults today never had the right financial role models when they were growing up with the result that many of us are in the dire financial situations that we find ourselves in. I look forward to following the other subjects that you have identified throughout the course of 2012. Fantastic. I have been thinking about growing up too and how I learned to use money responsibly. It's interesting because my parents used the same methods for all of us kids, but my brothers seemed to miss a few lessons. @Nigel Willmott - I agree. You have to start with the basics. I look forward to more conversations this year! John @MoneyPrinciple - I'm not the best at keeping things tidy either. Guess the kids will have to look up to us for other things! @ 20's Finances - Those brothers can be tricky! We have four kids and they are all so different. I can say the same thing to each one and they will all interpret it differently. It makes life interesting! Allowance was a real hot button issue when my son was younger. My ex-husband didn't want him to grow up feeling entitled, but I wanted to teach him responsibility. Now, at 13, he gets $10 a week for completing his normal chores and can earn more for extra chores. No matter how much he earns, 10% goes straight to savings. It has worked out really well. Back in a day, in a different life and in the different country we did not have credit cards. So when I moved to the US, I learned about c/c the hard way. :-) I enjoyed your points about allowances. That alone can teach kids quite a bit. I like the Save Share Spend format; even though the child has not "earned" the money he/she is learning to budget and save a % of their "income". Paying yourself first is one of the most important things to learn, the earlier, the better. I used to love allowances from the parents, I remember having to save up to buy a game or other stuff and it felt good because the fact that I saved it. Andrea @SoOverDebt - When spouses have different opinions of teaching kids about money, the topic can often get ignored. Kudos to you for working out a system that works for your son! Alyosa @MyBrokenCoin - Yikes! We definitely need kids and teens to understand credit cards before they are on their own. Neo @NetWorthProtect - We are seeing an increase in families who use the Save Spend Share method. Aaron Hung - Me too! Using your own money requires more thought and fosters a sense of pride.